ballistic missile, Iran, Israel, Nuclear, U.S.
On July 2-4, 2012, the Aerospace Force of the Iranian Revolutionary Guard Corps (IRGC) conducted a missile exercise, dubbed Great Prophet 7, which involved firing dozens of missiles at a target that resembled a U.S. airbase situated in Afghanistan, Bahrain, Kuwait, or Saudi Arabia. Iran is signaling that it is prepared for a military clash with the West and Israel, and possesses a devastating “second-strike” response capability against any attack on its nuclear sites. IRGC Aerospace Force commander Brig.-Gen. Amir Ali Hajizadeh claimed Iran had already amassed information on 35 U.S. bases in the region and had deployed missiles to destroy them within minutes of an attack on its soil. Hand-in-hand with continued progress toward advancing its nuclear program amid the recently renewed nuclear talks, Iran is well into the process of developing a deterrence doctrine toward its main adversaries in the region, namely Israel and the United States, while upgrading R&D for its missiles in a way that could eventually enable it to mount a nuclear bomb on a ballistic missile. Iran is dispersing its missiles throughout the country – deep in the interior, along the coast, at sea, and even beyond Iran’s borders. Iran has a broad doctrine of the use of force that also encompasses missiles located in Syria, Lebanon, and Gaza. Beyond deterrence, the exercise constitutes a message of force projection to the Sunni Arab states of the region, particularly the Gulf States that host U.S. bases and depend on Washington. Tehran is determined to fill any void left in the region and seeks to project Islamic power as U.S. influence in the Middle East wanes. On July 2-4, 2012, the Aerospace Force of the Iranian Revolutionary Guard Corps (IRGC) conducted its annual missile exercise, dubbed Great Prophet 7. It involved the firing of dozens of missiles and rockets of different kinds and ranges at a target on Iranian soil that resembled a foreign (i.e., U.S.) airbase situated in one of Iran’s neighbors (such as Afghanistan, Bahrain, Kuwait, or Saudi Arabia). The exercise was held, apparently not coincidentally, in the same week that the European Union imposed its embargo on Iran’s oil industry (beginning July 1). Along with its messages to the regional and international arenas, the exercise was timed to give the Iranian people a “morale injection” of technological prowess just as the sanctions were taking hold. The country’s economy is deteriorating as prices of basic commodities keep rising. Tehran, however, is trying to project a business-as-usual atmosphere despite the European oil embargo, seeking to calm Iranians and indicate that the country can overcome the “most difficult sanctions so far” (Ahmadinejad) – notwithstanding the likely high cost – just as it has been overcoming sanctions during the 33 years of the revolution. 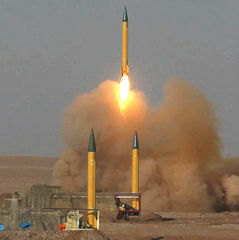 With the missile exercise and the terminology used by its various spokesmen, Iran wants to present the profile of a great power – one capable of a rapid, symmetrical missile response to threats against it (including missiles that, it claims, can hit radar facilities), of toughing out the continuing sanctions, and of projecting power toward the neighboring states. Added to this is the ongoing emphasis on the naval components of the asymmetrical response Iran would mount in case of a naval clash with the United States (including swarms of rocket-equipped speedboats, suicide speedboats, naval mines, etc. ), and on preparing terror cells for the “day of reckoning” at various spots on the globe. The recent exposure of Iran’s terror infrastructure in Kenya, as well as in India, Thailand, Azerbaijan, and Cyprus, should be seen in this light. Capable of Destroying Missile-Defense Systems? In the third and final stage of the exercise, IRGC missile units fired a number of Khalij-e Fars anti-ship missiles at maritime targets. Iran claims these missiles are immune to interception, extremely precise, and carry a 650-kg. warhead. Also in this stage, IRGC planes and attack UAVs (unmanned aerial vehicles) struck a number of targets.11 In an announcement at the end of the exercise, the IRGC affirmed that its missiles had destroyed the simulated foreign base. Hagizadeh’s press conferences at the start and conclusion of the exercise, along with military and political spokesmen’s references to its goals, well reflect Iran’s ongoing development of its defense doctrine. Hand-in-hand with the continued progress of its nuclear program amid the recently renewed nuclear talks, Iran is developing a deterrence doctrine toward its main adversaries in the region, namely Israel and the United States, while upgrading R&D for its long-range delivery system in a way that could eventually help it mount a nuclear warhead on a ballistic missile. Iran continues to develop ballistic missiles that can range regional adversaries, Israel, and Eastern Europe, including an extended-range variant of the Shahab-3 and a 2,000-km medium-range ballistic missile, the Ashura. Beyond steady growth in its missile and rocket inventories, Iran has boosted the lethality and effectiveness of existing systems with accuracy improvements and new submunition payloads….Iran may be technically capable of flight testing an intercontinental ballistic missile by 2015. During the last 20 years, Iran has placed significant emphasis on developing and fielding ballistic missiles to counter perceived threats from Israel and Coalition forces in the Middle East and to project power in the region…. Short-range ballistic missiles provide Tehran with an effective mobile capability to strike partner forces in the region. Iran continues to improve the survivability of these systems against missile defenses. It is also developing and claims to have deployed short-range ballistic missiles with seekers that enable the missile to identify and maneuver toward ships during flight. This technology also may be capable of striking land-based targets. This latest exercise is a direct continuation of the one the IRGC held last year, during which Iran disclosed its ability to launch ballistic missiles clandestinely and surprisingly from hidden sites and to hit Israeli and U.S. targets in the region. As this and previous Iranian missile exercises have demonstrated, Iranian long-range missiles (1,300-1,500 km.) are aimed at both Tel Aviv and Riyadh.20 Iran’s state-run media echoed Panetta’s April 2012 report, claiming it proves Iran’s missile might. The two most recent exercises indicate that Iran is not only working diligently to increase the number and kinds of its missiles of different ranges, but also to devise a doctrine for their effective use. At the same time, Iran is dispersing these missiles throughout the country – deep in the interior, along the coast, at sea, and even beyond Iran’s borders. Iran has a broad concept of the use of force that also encompasses missiles located in Syria, Lebanon, and Gaza. The exercises also make clear (as does the drizzle of missile fire from Gaza, Sinai, and Lebanon) Iran’s reliance on missiles as one of the main components of its national-security strategy and the answer to the threats it faces. Iran is continuing to combine a symmetrical missile response with intensive efforts to improve its asymmetrical missile response to U.S. naval and aerial superiority in the Gulf. Iran is also working to complete Israel’s encirclement with missiles of different ranges; some of those fired during the recent exercise are also possessed by Hizbullah (Zilzal and Fateh-110). Iran did not make reference during the drill to the broader context of the missiles and rockets held by Hizbullah, Hamas, and Syria that originate in Tehran. However, Iran sees these as part of its response in case it is attacked. It also continues to regard Lebanon as its “first line of defense” in its national-security doctrine both as a deterrent and a response factor, and views such missile fire as an asymmetrical answer to Israel’s superior technological capability and particularly its air force. Beyond deterrence, the exercise and the threats to block the Strait of Hormuz constitute a message of force projection to the states of the region, particularly the Gulf States that host U.S. bases and depend on Washington. Tehran is determined to fill any void left in the region by the United States and aims to be its dominant actor. With all its missile launchers, Iran seeks to project Islamic power as U.S. influence in the Middle East wanes and the region’s strategic landscape rapidly changes with the rise of the new Islamic regimes. Iran has already announced that it is prepared to transfer its military capabilities and even its “peaceful nuclear knowledge” to Muslims, and in some cases is already doing so. In other words, Iran wants to revive the export of the Islamic Revolution with the revival of Shia Islam in the region. Its agenda goes far beyond the Gulf region and the Middle East, as it aspires to redefine the rules of the game in the regional and global arenas and present itself as an alternative to what it calls the decline of communism and capitalism – a kind of Islamic imperialism. Iran is challenging the “Great Satan,” intensifying its threats against the “Little Satan” (Israel), and trying to behave like a superpower that “brings justice to the world.” Given the rapid changes in the Middle East, any concession by Iran, particularly on the nuclear issue, is no longer seen as an option. In Iran’s view, this is the time when it is supposed to be the spearhead of this great transformation, rather than bow to international pressure. The format of the latest Iranian missile exercise sent a clearer message both to the United States and the regional states that Iran is prepared for any scenario and does not fear a confrontation. 17. Mehr news agency, July 8, 2012.